This incalmo wallbowl features 5 separate sections that come together to form an absolutely stunning piece of glass wall art. Each section was formed as its own separate molten bubble, then they were fused together one at a time and then finally blown out as one unified bubble using the incalmo method. 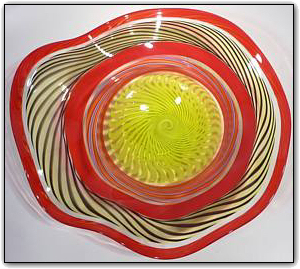 The colors, the patterns and the lightly fluted edges all come together in this perfect specimen of a wallbowl.